Charlotte Eskildsen is founder and creative director of Designers Remix, a women’s brand created in 2002 with her husband, Niels Eskildsen. Five years later, they founded Little Remix, the girls’ version of the brand, created by this danish mother of two little girls: Smilla and Sofine. She confides that she “felt the need to create a children’s line for girls” when her first baby was born and tells us about her desire to create cool clothing, for mini-fashionistas. Rock’n’roll! My name is Charlotte Eskildsen. I am the founder and Creative Director of Designers Remix and our kids' line, Little Remix. I was born and raised in Denmark. In 1999, I graduated as a Fashion Designer from Design Management Kolding and, in 2002, founded the brand Designers Remix. When I gave birth to my first daughter I felt the need to create a kids’ line for girls, which led to the launch of Little Remix in 2007. Today, I live north of Copenhagen with my husband and CEO of Designers Remix, Niels Eskildsen, and our two daughters, Smilla and Sofine. When and how did you decide to work in the fashion industry? Do you remember a moment as a child, or a little story that pushed you into this area? Growing up, my family was always creative. This is something that has always stayed with me. I have always had a huge interest in architecture and Danish furniture design. So, I guess all of these creative influences from my childhood are what led me to the fashion industry. To this day I love to work on different arts & craft projects with my kids, like drawing or beading. My creative upbringing is naturally something I want to pass on to my own kids. What was your aim when you first created your own brand, how would you describe it? I started to customise or “remix” past garments into new and exciting pieces. In 2002, my husband and I launched the brand Designers Remix, with the aim of creating quality clothing that reflects my own personal taste and design language. Today, the brand is characterised by contemporary, Scandi-cool quality collections that are deeply anchored in Danish design heritage, with a feminine silhouette. I want to design clothes that make a woman feel beautiful, clothes that you will have in your closet forever and never want to throw away. This is why fit and quality go hand in hand at Designers Remix. I’ve read that your husband is the CEO of the brand, what is it like to work together as a family? A lot of people might think it is a struggle to be working so closely with the person you are married to and have two kids with. But I must say, I am so grateful to have such a big support close to me 24 hrs. a day. I could never have done this without the huge support from my husband. Both of us love our jobs so, to share this great journey with him, is a dream come true for the both of us. When did you realiSe you wanted to design for kids? What inspired you to do so? With the expansion of my own family in 2006, I decided to expand with a miniature collection as well. This life-changing event naturally opened up the opportunity to create childrenswear that was inspired by womenswear silhouettes. I would never have gone into children’s wear without having my own - it ́s too special. When you have your own children, you get so inspired and filled with energy. It is really the beauty of life. This is why I wanted to include my children in my passion for design. Our mission for the brand is to create contemporary, stylish and directional childrenswear that allows children to children. To me, children should always be ready for a little bit of misbehaving. I love the fantasies of a child - somehow their world is bigger than ours. And our mission is to be part of every mini-fashionista’s fashion fantasy. 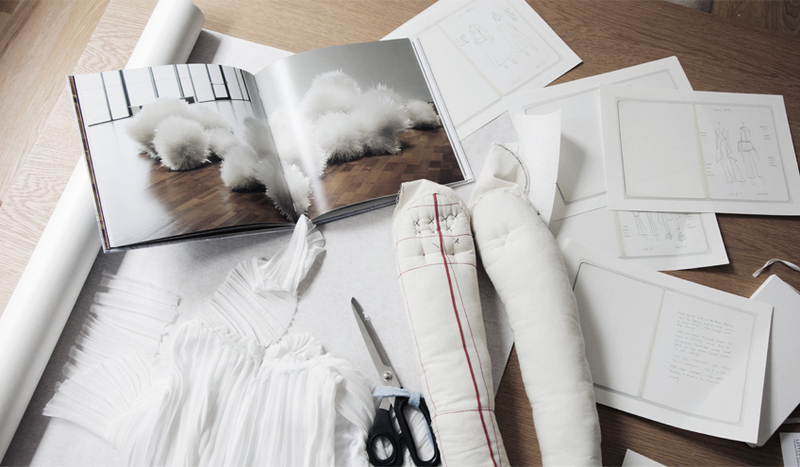 Where do you find youR inspiration to create a collection? Do you think about a theme first or do you start with drawings? I travel all the time and find a lot of inspiration abroad. It can be everything from skyscrapers, local environments, and construction sites to concept stores and furniture. When things inspire me I often grab a pen and start drawing. As one drawing becomes another, my mind starts to grasp a concept. When I see a theme in my drawings and concept, many ideas end up in the trash and I only select the looks that I feel match the overall feel of the collection. As I mentioned, I have two girls. Little Remix was founded because I found it so hard to find childrenswear that I would like my girls to wear. Everything is always very girly with flower prints and pastel colours. I didn’t want my girls to look like mini princesses and that is why I founded Little Remix. 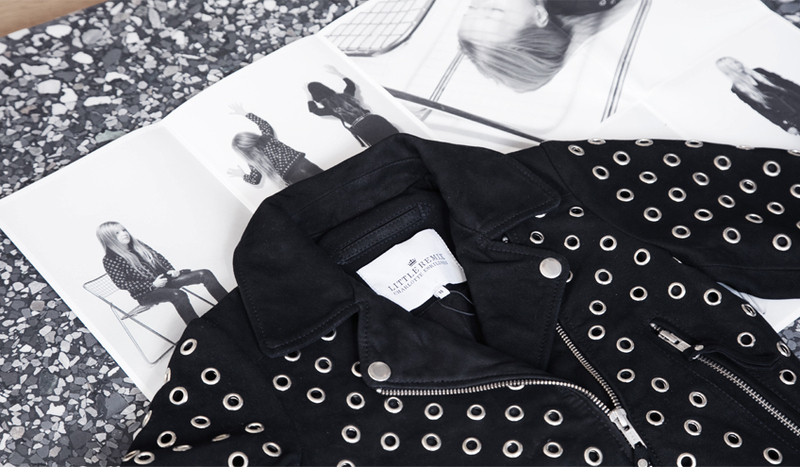 The essence of the brand is captured in our Aida Soft Biker jacket in leather. It’s the idea of a “mini me” style that drives the brand. What are youR icons and sources of inspiration in art (movies, music etc...)? I am very inspired by past Danish furniture designers. I must highlight one in particular. His name was Arne Jacobsen. In my FW16 collection for Designers Remix, I have dedicated an entire print story to the Radisson Blue Royal Hotel based in Copenhagen, as he designed the hotel both inside and outside. And more particularly, the colour story of “Room 666” in the hotel, which is a room that is kept in Arne Jacobsen’s original design, is now part of the collection as well. You were particularly inspired by architecture, where does this passion come from? What attracts you to that? Can you name a few designers that you feel particularly close to or that you particularly like? My love for architecture is a result of my interest in furniture design, which are closely linked together. I have always been fascinated by the bold iconic Scandinavian design that is very strict in its simplicity. The inspiration is expressed through how I think and create shapes. I design with 3D dimensions in mind, where the silhouette and materials are much more important than a print. You will never see me make a whole collection of prints. For me, it is all about the shape. Our iconic Remix Ruffles are a good example of how to work with certain materials and create a shape that is technically challenging in both design and construction. 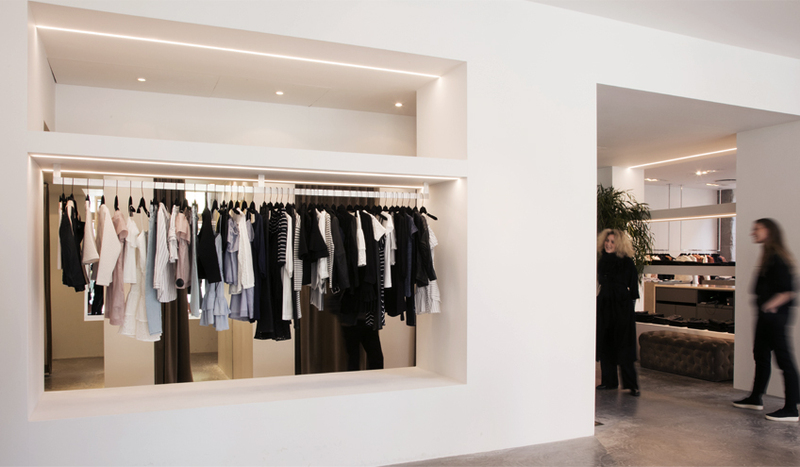 What are your favourite corners, shops, boutiques, secret places in Copenhagen? Even though I travel a lot and see many beautiful places all over the world, I absolutely love the city of Copenhagen. The area around our HQ is quite amazing. Here you find some of the best cafés in town. If you are as fascinated by architecture as I am, I would recommend you to visit the newer part of the city called Orestad. This is like a park of tall buildings made by some of the newest, most talented architects. Furthermore, I would visit the Queen’s garden by the sea. The big fountain in the middle of the garden in the setting of the sea view of the Royal Opera House is absolutely breath-taking. It is a quiet little garden in the middle of the busy city centre. The city is filled with different little spots, so it is just a matter of walking around in the different districts and you will soon find many cool places where you can enjoy the city. How would you define the Little Remix kid? The typical Little Remix girl is aged 8 to 14 years old. She is the cool and confident girl that stands out from the crowd and inspires her friends. She pushes the boundaries of kids’ wear every day, as she is very much aware of how to express herself through her personal style. Her signature outfit is leather dungarees, feminine ruffles and a biker jacket – spiced up with temporary tattoos like a mini-rock star. She is truly a mini-fashionista living in the fast pace digital society of today. Do you think about the colours first, or the material, or the shape? How do you create the clothes? My process of designing the collections for Little Remix is closely linked to the process of designing the adult collection. The Little Remix collection is often a mini-version of the pre-collections from Designers Remix. We take out a few styles, and add more child-friendly pieces to kids' collections, since there is some practical elements in designing kids' wear we have to keep in mind and respect. Can you tell me the process for the photos of your collections? We are always trying to match the collection with a setting or location that underlines the key message of the collection. However in order to keep the very personal relationship I have to this collection, we only photograph my girls and their friends for the Little Remix lookbooks. It is a fun but super busy day, as it is a huge collection and the girls like to play around with each other. You never really know what the outcome of these shoots will be, but that is part of the charm. What can we expect for the next collection? The Little Remix AW16 collection is inspired by the punk movement and it is called “Girls Don’t Cry” as a reference to one of my all-time favourite songs, “Boys Don’t Cry” by the Cure. The collection is kept in burgundy, caramel and grey colours, like autumn leaves on a concrete floor. The punk culture is manifested in the contrast of mixing rock pieces with very feminine and preppy styles. The collection carries a signature black story in lace with leather biker jackets, big herringbone artwork in a vintage looking faux fur and studded belts with rivets and crystal stones. I would style the big masculine men’s inspired coat with a heavy knit dress or flared jeans. If Little Remix had a motto, what would it be? Little Remix is avaible at Smallable online and in our Parisian concept store 81 rue du cherche-midi - 75006. Click here to see 88 more products that match your search in the outlet section.